When the sun's toughest rays, many sacrifice safety for a high SPF in their sunscreens. Natural sunscreens are in abundance in SPFs ranging from 15-30, but the higher SPFs are harder to find. If you're looking for a safer sunscreen that can withstand some serious rays, consider True Natural's Broad Spectrum SPF 50 Sunscreen Lotions. 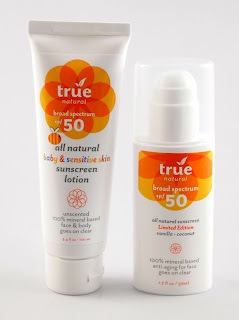 True Natural offers several options for SPF 50 sun protection. I tested the unscented sunscreen lotion (baby and sensitive skin) as well as the vanilla coconut facial sunscreen. The unscented sunscreen rated an excellent 2 on the EWG Skin Deep database, while the scented formula jumped up a bit due to the listing of "fragrance". However, I believed this ranking is largely inaccurate for this product's fragrance, as it is certified by the Natural Products Association and does not contain synthetic fragrances. Regardless, I encourage manufacturers to list individual extracts or ingredients when possible. Between the two products, I preferred the texture of the lotion, as the facial sunscreen felt ever so slightly greasy on my face. While this may be an advantage for those with drier skin, my normal to oily skin does better with less moisture. The vanilla coconut fragrance was light and not overwhelming, while the unscented version was true to its name. I liked the package design and wanted to love these products, but I was disappointed by the lack of a vegan option. All sunscreens currently contain beeswax and sodium lactate (though sodium lactate is often plant-derived). Otherwise, these are definitely a better option than conventional high-SPF sunscreens, especially if you aren't a vegan. Also available on Amazon.com: unscented lotion and facial sunscreen. UPDATE: A representative from the company reports that they tried making a vegan version of the sunscreen. However, they preferred the performance of the beeswax and chose "to compromise...in the interest of a better feeling and better performing sunscreen." UPDATE: I'm thrilled to announce that there is now a vegan version of this sunscreen! Click here for more information. I have one set of two sunscreens (unscented lotion and vanilla coconut facial sunscreen) (a $39.98 value) available to give away to one lucky reader! One winner will be chosen at random from all eligible entries. Just leave a comment through the Rafflecopter widget below stating your favorite summertime scent. Additional entries are available for posting this giveaway Twitter (this can be done daily for up to one additional entry each day, also using the widget so you get credit). Contest ends 5/18/12 at 12:01 AM EST. Best of luck! I LOVE the smell of lilacs! That's more spring, I know, but it's one of the first smells when the weather gets nice and you want to be outside! I love the smell of the ocean! Definitely my favorite!